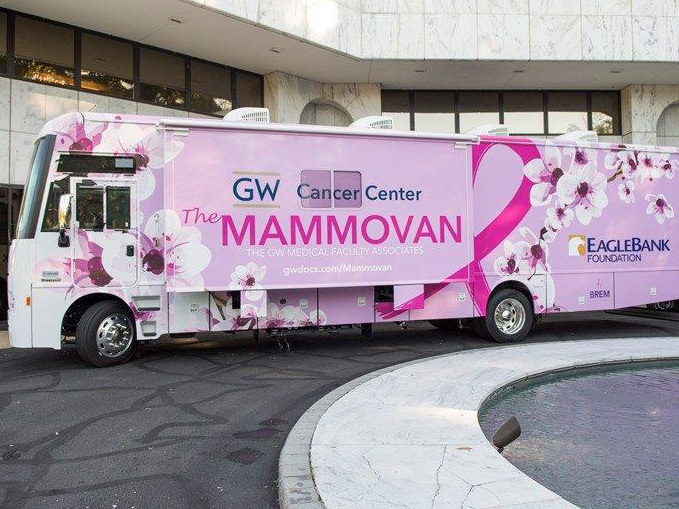 The GW Mobile Mammography Program—The Mammovan—began in 1996 with a singular, ambitious goal: to make life-saving, early detection of breast cancer possible for all women throughout the metropolitan Washington, D.C. area, regardless of their ability to pay. A key goal of the program is to aid in early detection to ensure the best possible health outcomes for women identified as having breast cancer. This self-contained mobile unit travels to corporate and community sites and provides breast cancer screening to more than 2,500 women annually in a comfortable, convenient environment. The Mammovan helps to break down both access and time constraint barriers by reaching women where they live and work, including underserved communities without existing facilities. The Mammovan provides state-of-the-art screenings (including digital mammography) at 160 sites throughout the D.C. region. The Mammovan's work is made possible by the generous support of corporate, foundation, and individual donors who share in the program's mission to both prevent and provide early detection for breast cancer. If you cannot attend but would like to support The 7th Annual Blush Lunch and The Mammovan, click here.